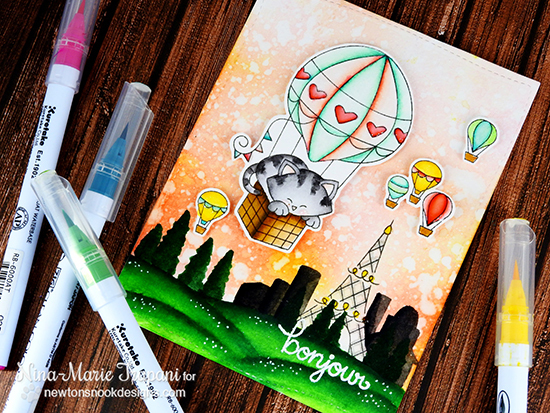 Today we have a very dreamy card by Nina-Marie using our Newton Dreams of Paris stamp set! Isn't that sky with the peach and yellow tones so lovely? It makes the perfect backdrop for the image of Newton in his hot air balloon! To set the scene she added the stamped eiffel tower and added in some additional buildings and trees to make a gorgeous skyline for the kitty and the hot air balloons to float over! Such a beautiful card! Thanks, Nina-Marie for the beautiful card today! To see more details on this card and more projects by Nina-Marie, you can visit her blog, Nina-Marie Design. Wow!! Beautiful scene!! Nina's coloring always blows be away!! Super cute Nina, love the sleeping kitty in the basket. GORGEOUSLY done - I am in awe and this card utterly delighted me - what a charming and sweet scene - wish I was there with that snoozing kitty - in a balloon over Paris - what an amazing thing that would be!!! Kudos to Nina-Marie for coloring that is simply out of this world!! This is absolutely amazing!!! Such an adorable scene and so perfectly colored! Gorgeous amazing coloring! Absolutely adorable!